Officers at Lincolnshire Police have won an award after rescuing an unconscious man from a burning building in Spalding. PC Andrew Atkins, PC William Murphy and T/Insp Nick Waters received a Certificate of Chief Constable’s Commendation at a ceremony last night, where Louise Haigh, shadow policing minister, presented the awards. Other winners were: PC Adam Barton and Sgt Robert Gray, who received a Royal Humane Society Resuscitation Certificates and Certificates of Chief Constable’s Commendation. After policing a Lincoln City football match in March 2018 the officers were alerted to a man who had been taken ill. The man was unresponsive, and when the officers could not feel a pulse they commenced CPR. The man was later taken to hospital by ambulance and went on to make a full recovery. Their assistance in providing technical guidance to the investigation into a fatal road traffic collision on the remote island of Saint Helena proved to be a turning point. Chief Insp Dave Plumb said: “As a result of their support, the offender was convicted and imprisoned leaving an increased confidence in the judicial system on the island. PC Brown investigated a fatal collision which happened in March 2016 on the A15 at Roxholm. 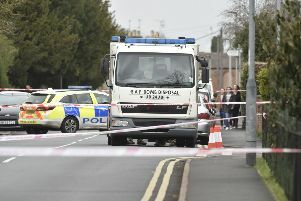 It was claimed by the defence that strong winds had blown the defendant’s car onto the other side of the road into the path of the oncoming car. At the conclusion of the case His Honour Judge Hirst singled out the collision investigator, PC Brown, for special praise, observing that he had obtained powerful footage on the day of Storm Doris. He indicated that Constable Brown should be commended for his conduct.